Digital Synsations hangs together wonderfully as a collection of well-chosen presets representing the coming of age of digital synthesis. The name! At this price, we really expected to see four bespoke parameter sets. It feels like UVI have been leading up to this one with their last few releases. 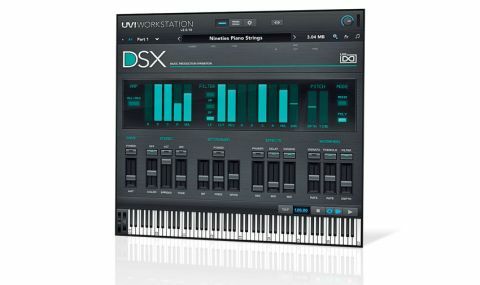 Digital Synstations is a massive compilation of multisampled classic digital and hybrid synths from the early 90s, running within the free UVI Workstation engine or MOTU MachFive. "It's a a tasteful, technologically comprehensive selection, and no mistake"
By massive, we mean 25.5GB, and the synths in question are the Roland D-50, Yamaha SY77, Korg M1 and Ensoniq VFX - a tasteful, technologically comprehensive selection, and no mistake. You might well be assuming at this point, as we did, that you get four unique interfaces for your money, but unfortunately, that's not the case. Despite each one having its own vaguely-original-inspired look, all four ROMs share a common parameter set. You get amp and filter envelopes, portamento and overdrive, plus phaser, delay and reverb effects, the latter being UVI's new SparkVerb, which impresses with its Lexicon-style Bass Decay multiplier and characterful sound. Of course, you also get access to the processing innards of UVI Workstation or MachFive. The ROMs themselves are predictably excellent. 501 patches have been sampled (divided roughly equally between the four synths and taking in almost 19,000 samples), including basses, pads, leads, keys, orchestrals, polysynths and so on. The particular strengths of each synth have been expertly played to in the capturing process, from the edgy tones of the M1 to the weird, ethereal waves of the VFX, and the very real potential for the whole thing to descend into a cheesy 90s nightmare has been deftly avoided. Dreadful name aside (what is it - a box of electronic chocolates?! ), Digital Synsations hangs together wonderfully as a collection of well-chosen presets representing the coming of age of digital synthesis. The depth and clarity of the sounds are at times astonishing, and the vast majority of the sounds could easily find a home in any modern genre. That said, the controls on offer aren't particularly inspiring, and the fact that all four interfaces are identical is disappointing.